No matter how much you water your lawn, it may still not be enough. To maintain the lushness of the grass, why not consider professional lawn fertilization in Omaha? You can trust the unparalleled services of Heroes Lawn and Landscape to keep your lawn in tip-top shape. From lawn care maintenance to landscape design, we help homeowners turn their yards into a lasting outdoor paradise. You can try fertilizing your lawn on your own, but excellent results are not guaranteed. Without the proper equipment, you risk unevenly applying fertilizers on your property in Omaha. As a result, your lawn becomes an unpleasant combination of brown spots and green patches. Also, every grass type requires a particular kind of fertilizer. A mismatch of these factors may provide unwanted or little to no results for your Omaha backyard. If you want to beautify your lawn, it’s better to opt for professional lawn fertilization in Omaha. At Heroes Lawn and Landscape, equipment is carefully selected to ensure stellar results. We also invest in our team members abilities to provide quality care and value to your property. In spring, we use pre-emergent weed control with fertilizer and broadleaf weed control to treat your lawn. Before summer starts, our providers of lawn fertilization in Omaha will come back to treat your lawn with care. During this period, we apply pre-emergent weed control with fertilizer and broadleaf weed control on your lawn. In summer, we apply summer fertilizer, grub control, and broadleaf weed control on your lawn. We will feed the grass with macronutrients and use broadleaf weed control in early autumn. As winter approaches, we will treat your lawn with winterizing fertilizer and broadleaf control. 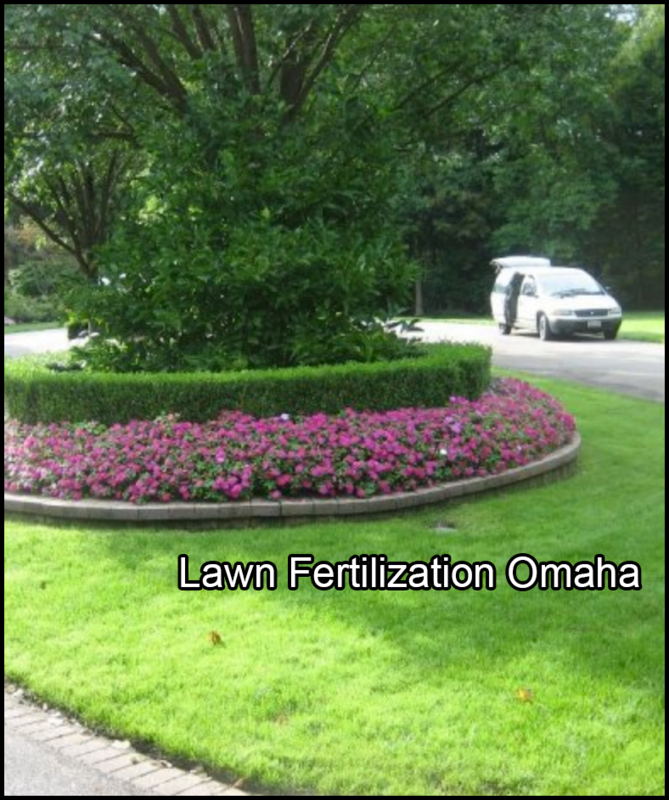 Lawn fertilization in Omaha eliminates and prevents weed infestations. Lawn fertilization in Omaha helps with drought. Besides preventing weed growth, lawn fertilization in Omaha helps with drought. Dehydration of grass typically happens in hot weather when plants are increasingly vulnerable. Without protection against the heat, the grass can lose its lushness. Luckily, you can prevent this with professional lawn care fertilization in Omaha. Along with sufficient watering, lawn fertilization in Omaha performed by our licensed applicators will care for and protect the grass in your lawn against the summer heat. Consequently, your lawn will be better prepared for drought. Lawn fertilization in Omaha contributes to the production of more oxygen. When our professionals perform lawn fertilization in Omaha, fresher air circulates in the yard being serviced. That’s because more oxygen is produced if your property is crowded with healthy grass and plants. As a bonus, you can enjoy cool breezes even on hot days. Lawn fertilization in Omaha also serves as a defense against urban pollutants. By hiring our providers of lawn fertilization in Omaha, you can have a dust-free and cleaner yard. Prevent your lawn from looking dull and worn out by choosing Heroes Lawn and Landscape for your lawn fertilization in Omaha. With our five-step program for lawn fertilization in Omaha, we’ll bring out the beauty and and enhance the value of your home. To learn more about our lawn fertilization in Omaha, visit www.heroeslawnandlandscape.com. Heroes Lawn and Landscape is a company that brings new meaning to the term, “full-service.” We are much more than just a landscaping company. Apart from landscape design, we also offer lawn care, lawn care maintenance, mosquito control, and holiday lighting services. We know how tedious it is to have to hire different companies in Omaha to handle all aspects of landscaping, lawn care, and outdoor lighting. Our goal is to save our clients time and energy by providing a one-stop solution to all of their outdoor improvement and maintenance needs. The patch of land behind or in front of your house can serve a wide range of purposes. With our help, it can become an extension of your home or a showcase for your ornamental plants. Our services can turn a humble backyard into an outdoor entertainment area by installing a custom-designed patio, and make hard-to-reach outdoor areas more accessible by constructing garden paths. By installing hardscapes such as retaining walls and steps, we can make your lawn or yard more functional and visually appealing. Heroes Lawn and Landscape was founded by four friends. They noticed that home and business owners had to go to different companies for lawn care, holiday lighting, and other landscape improvement and maintenance services. To meet the need for a one-stop solution, these friends established Heroes Lawn and Landscape in 2014. From an idea among friends, our company has grown to a full-service company serving Omaha, NE and surrounding areas. In 2016, we were awarded Thumbtack’s Best of 2016. Keeping grass, plants, and trees beautiful and healthy requires regular lawn care maintenance and fertilization. However, looking after your lawn can be difficult when you have other responsibilities, such as work and family. Do you want a new look for your outdoor spaces? Turn to Heroes Lawn and Landscape for expert landscape design and maintenance services. Our team has the skills, experience, and equipment to implement a full-scale landscape design project for residential and commercial clients. We meet with our clients first so we can fully understand their goals. Also, we provide regular updates throughout the course of the project to ensure that our clients and our team are on the same page. Our seasoned installation crew will deftly and efficiently bring your plan to fruition. Afterward, you can opt for our maintenance services to ensure that your landscape’s features look as amazing as the day they were installed. With our services, your residential backyard can become a pest-free oasis. We take great pride in our comprehensive mosquito and tick control strategy. Our team won’t just spray your backyard and call it done. We will actively monitor pest populations and weather conditions to adjust your treatment for the best possible results. Do you have a special occasion coming up? Make sure your home or place of business looks beautifully festive with our holiday and event lighting services. We have more than three decades of experience in the Christmas lighting industry. You can be confident in having us design and install your exterior lighting display. Afterward, we can take down and store the lights until you need them again. Save time and money by having Heroes Lawn and Landscape install turf on your lawn instead of grass. With our lawn care services in Omaha, you won’t have to fertilize, mow, or water your lawn again! What’s more, synthetic turf is easy to care for. It’s also pet-friendly. Winters in Nebraska can be harsh. If you live in the area, you’d know that shoveling snow is time-consuming and back-breaking work. Not removing snow, however, can cause even more problems. Our company uses products that are strong enough to eliminate ice without damaging concrete or vegetation. What’s more, during the winter season, we are on call 24 hours a day, seven days a week. At Heroes Lawn and Landscape, we pride ourselves on our ability to provide our clients with the services they need to keep their lawns and yards attractive, functional, and safe. Our exceptional workmanship, dedication to customer satisfaction, and innovative approach to landscaping are just some of the many things that set us apart from the competition. Learn more about how we can transform your outdoor spaces into showcases by giving us a call. You may also request a quote by filling out our online form. We look forward to helping you achieve the lawn or yard of your dreams!